On the 27th February Poets’ Corner are coming back for their first event of 2019! 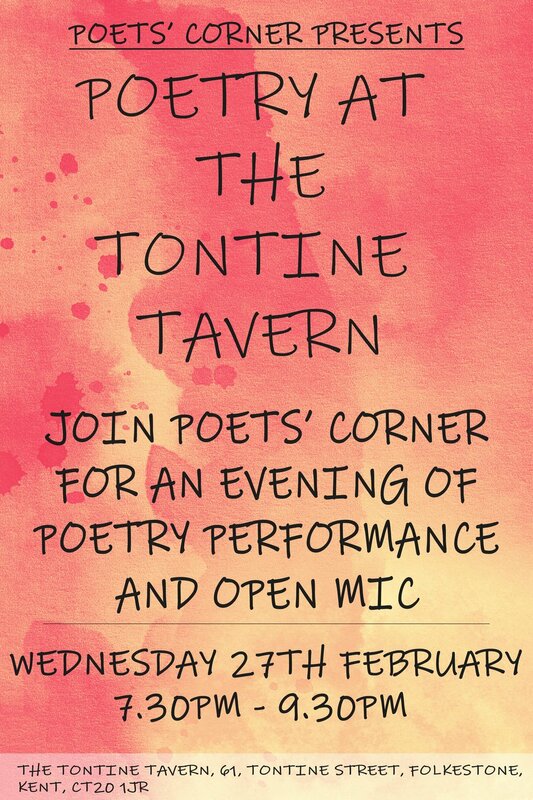 We will be at The Tontine Tavern (formerly The Troubador). Join us from 7.30 for an evening of poetry performance by Anthony White, Faith Warn and myself and then an open mic where you can perform your poetry! It would be great to see you, find the Facebook event here! A poem inspired by a friend taking selfies in every possible mirror. This is a poem I wrote a few years ago called Sowing Love, about the nuturing beauty of how we love and how that reveals itself. Happy Valentines Day! A poem that first came to me seeing the beefed up patrols in the Channel, and echoes I heard from that in the media. Happy New year! I hope 2019 is filled with joy, laughter and flourishing! After an abridged version appeared on Dominic King’s BBC Radio Kent show Monday 17/12/18, here is the full length version of Twinkle. This is a poem written back in the Summer for Byron Vincent’s Love Box, performed at the closing event of Normal? Festival of the Brain 2018. A poem for a friend who recently passed away. This is a poem written about the feelings left behind after an Erasmus+ trip. Learn languages in a friendly atmosphere and discover new cultures! The Junction 13 Open Stage! The Junction 13 Open Stage is a warm and friendly space for performers new and accomplished. Join me for a poetry workshop at the amazing Happy and Glorious in Cranbrook!